I’VE BEEN HEMMING AND HAWING over whether or not to tell you it’s my birthday, and also whether or not to mention a certain gift I received. But what the hell…it IS my birthday, and I DID receive a pretty special gift. That’s it pictured up top — Minton china, circa 1930. My partner and I actually found these pieces at a little antique store in Lenox, Massachusetts. I swooned, and he said “for your birthday.” You see, I love old things (especially now that I’m old, too), and this china really goes well in our dining room. 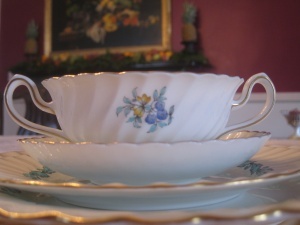 The Minton ‘Aragon’ pattern features pink, yellow, and deep blue flowers. These are surrounded by a border of blue — almost turquoise — leaves. My favorite part of each 9-piece setting is its two-handled soup cup. According to Emily Post, it’s socially acceptable to sip pureed soups from such cups. Consequently our Butternut Squash Soup did not require spoons. I can’t tell you what a relief it is to at last have eight matching china pieces in the house. Are you fond of old serving pieces, too? Hungry for more? Sign up for my weekly newsletter. Happy Birthday Kevin… I remember the day well… You were soooooooooooooooo cute. 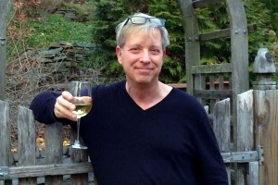 Gerry K.
Happy Birthday Kevin! What a lovely gift. I hope you had a great time celebrating! Happy Birthday! What a wonderful gift. Although I love old china, I'm afraid of breaking it…and since I don't entertain, I don't really have a cause to use it. My mom has both sets of my grandmothers china-which is mine. At Thanksgiving we ate off of my great grandmother's platter. I love the design of your new set! Thanks! And by the way, Gerry Krueger (the top comment) was at the hospital when I was born. A very Happy Birthday to you Kevin! (Will had given me the head's up over the weekend….) Love the china! A very Happy Birthday to you Kevin. I love the china. Of course, I love all old china. I have three sets of transfer ware that I rotate according to the season. We eat with it every night. Why have nice old things if you aren't going to use them? Brenda & Patty – Thank you! Arianne377 – I absolutely agree with you — I like to use nice things on a day-to-day basis. And, I love transfer ware…one day I hope to build up my blue and white collection. Hi Kevin: Happy Birthday! We got your and Will's Christmas card and found out about this website in the newsletter. I LOVE IT. We have been spending a lot of time in our farm in NC, and getting it ready to retire to in a few years. Your website is going to be very valuable to me. Ray – Welcome, and thank you. I'm at your service! Kevin, hope you had a wonderful birthday. As you know, I love all of your gardening and cooking tips. Happy (now belated)B-day. Love the picture of your dining room with fireplace! What color did you paint the walls — or is that wallpaper? Happy Birthday, Kevin! You Saggitarrius! I love the blue border on the china. Enjoy! Have a great one, Kevin. I'm glad you actually use your china. 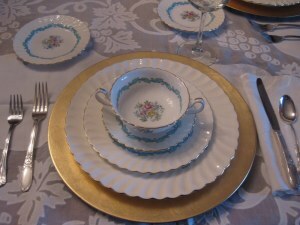 I know a couple who've been married more than 40 years, but still have their (very beautiful) wedding china in a cabinet. They are afraid of breaking it! 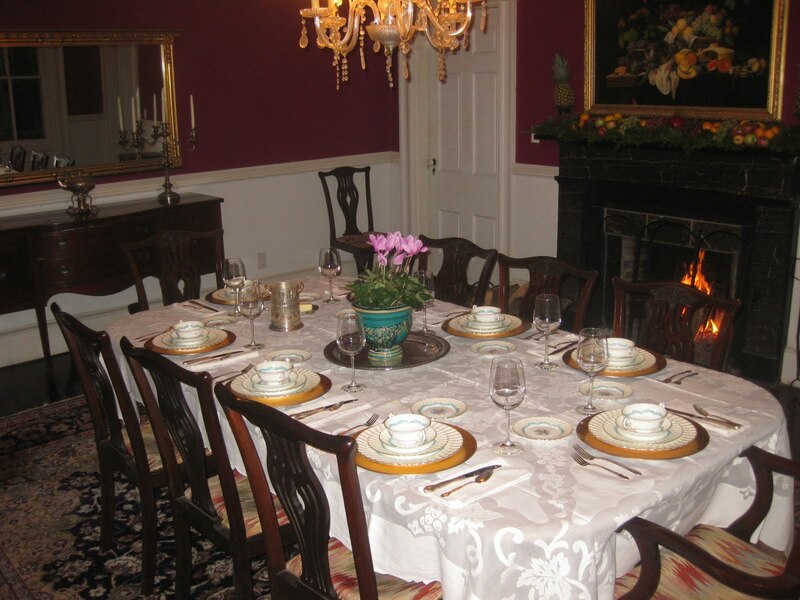 Eric – I painted the dining room walls “Old English Rose.” There is a slight amount of blue in the paint, which means any decorative item with blue in it (especially Royal Blue) shows well in the room. Thanks, Alice, and welcome to A Garden for the House! This china is beautiful, what a wonderful birthday present! Hope you enjoy many many more. Now those are really lovely! And speaking of your partner, when's the wedding?! I can just imagine the menu! Do you happen to have the recipe somewhere on the site for the pot roast? I’ve looked but cannot find it. PS – glad you had a wonderful birthday! 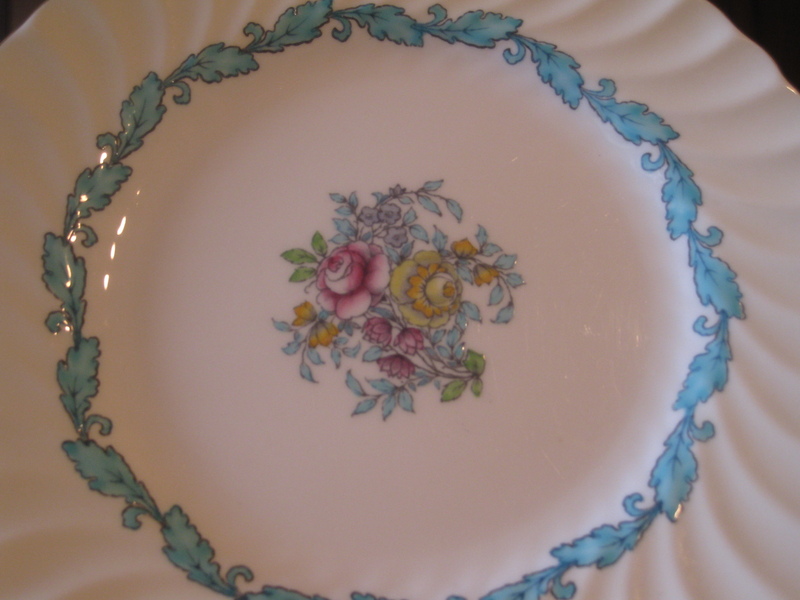 One of my hobbies is collecting antique china, I love your pattern , perfect for a gardener and your historical house. Just reading some of your older posts Its way to late to wish you a Happy Birthday from 2010. 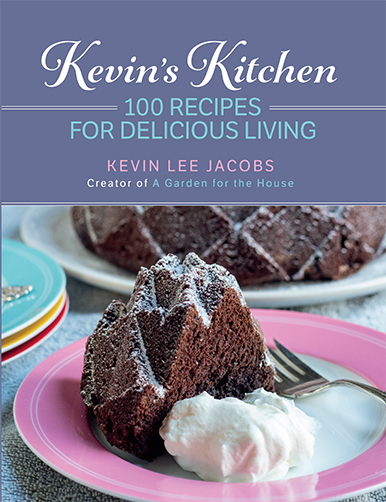 Isn’t it amazing its been that long ago and your tips and recipes have lived on.